Spring Cottage07800548080work Self-cateringLovely cottage with all the modern conveniences and appliances that you will need. There are two bedrooms in the cottage - one double king-size and one twin which can be made into a king size double. Bathroom with loo, counter-top sink, bath and separate shower above. Well equipped kitchen/diner with large oak dining table and chairs. The living-room features a modern wood-burner, exposed stone walls, wooden beams and is equipped with two comfy sofas and a stocked bookcase. TV, VHS, DVD, CD and iPod player. A detached wooden framed conservatory with seating is the perfect place to enjoy sunny afternoons. Surrounding the cottage is over an acre of garden including an enclosed cottage garden with seating and BBQ. Above the cottage is an apple orchard which is carpeted in bluebells and wild garlic in the Spring and above this ancient woodland. Lovely cottage with all the modern conveniences and appliances that you will need. 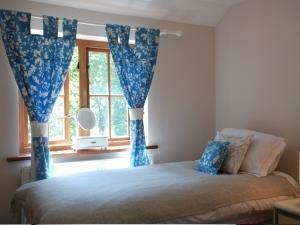 There are two bedrooms in the cottage - one double king-size and one twin which can be made into a king size double. Sufficient parking for two vehicles. Spring Cottage is within 300 metres of the River Wye and less than a mile from the Offa's Dyke Footpath. A number of less known footpaths are available from the doorstep of Spring Cottage. Children welcome from any age. Turn off the A466 signposted Brockweir. Cross Brockweir Bridge then take a left directly opposite Brockwer Country Inn, signposted Underhill. Continue for approx. 1 mile, bearing right at the junction - (road narrow and steep in places). Spring Cottage is the last but one house on this lane. Public Transport: Nearest train station - Chepstow. Bus service runs between Chepstow and Monmouth on the A466.